« Henry Norris at the Arsenal: Part 1. How Arsenal fell from grace. In 1971, at White Hart Lane Arsenal won their first league title since 1953 and won the league with just one point less than the record breaking 66 points achieved in 1931 when Herbert Chapman won Arsenal the league for the first time ever, the club playing the same number of games. And on 8 May 1971 Arsenal carried on where they had left off at Tottenham the previous Monday and won the Double for the first time, beating Liverpool 2-1 in the FA Cup, in extra time. Kelly and George got the goals – with Charlie George doing his famous on-the-ground celebration that is still shown as part of the prelude to games at the Emirates stadium. Eddie Kelly’s goal is also of note. He wasn’t even listed in the programme, coming on for Storey on 65 minutes, and yet scored the first Arsenal goal. At first it was thought that George Graham had scored, and Kelly even went to Graham to congratulate him, but it turned out that it was Kelly’s goal: Graham had certainly distracted the keeper, but Kelly got the last touch. Graham however did get the consolation of being named Player of the Final. Frank McLintock was player of the year having played in 42 league games and all nine FA Cup matches. As for the game itself, Arsenal missed at least three superb chances in normal time, George, Kennedy and Armstrong all missing out. And then Liverpool scored first in the second minute of extra time. Kelly’s goal came ten minutes later and Charlie George won the Double with ten minutes to go. It was only the second time Arsenal had played in front of 100,000. The media however were unimpressed, generally calling Arsenal the best of a poor bunch, which hardly reflects the battle between the top two in the league, nor two European trophies being taken by English teams, and a third club making one of the Euro semi-finals. But it was ever thus. Some 33 years later some of the media had reservations about the Unbeaten Season too. On 9 May an estimated half a million people are said to have lined the streets to see the Double Winners’ Parade. Frank McLintock is also said to have fallen asleep on the town hall steps due to some energetic celebrating the night before. Attending both the Tottenham games and the Cup Final was George Male, whose final match for Arsenal was 23 years previously on 11 May 1948 when the result was Arsenal 8 Grimsby 0. George was the first ever player in the League to win the championship six times and played 285 times for Arsenal. He then became a coach for the club working with the youth and reserve teams, as well as working as a scout, and it was in this role that he discovered Charlie George. Having joined the club in 1929 he retired from a life in football and a life serving the club he loved, in 1975. He died in February 1998 aged 87, the last survivor but one, of the men who played for Herbert Chapman. Seven months later Ray Bowden, the final hero of Chapman’s Arsenal died aged 89. The very last connection with Chapman passing away in the year of the utterly unexpected Double. 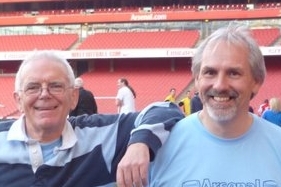 On 14 May Arsenal’s Cup Final record, “Good Old Arsenal” entered the top 40 singles charts. It is perhaps best not to dwell on this too long save to note one rather amusing side-issue. For many years the Daily Express had bought the rights to produce a song sheet that could be used by fans to sing Abide with Me and their own club song during the Cup Final. However the newspaper, and its nominated cup final celebrity Jimmy Hill, became very concerned because in the run-up to the final, they felt that there was “confusion” over what was the “official” Arsenal song for the final that Arsenal fans would sing. The fact that there might even be such a thing and that the fans were not capable of devising their own song or songs, shows how football had always been run in the past, with the image of the game controlled by the media. In the end Jimmy Hill announced in the Express that he had taken the decision in consultation with the club and printed what now the official Arsenal song – which he then claimed to have written. No one took a blind bit of notice, and the whole notion of an official fans song sheet ceased after this final. One week after the cup final, on 15 May John Roberts made his international début. He only made 56 league starts for Arsenal, but 18 of those were in the first Double season. The following week Frank McLintock played his ninth and last game for Scotland. After retiring completely from playing, he joined his old club Leicester City as manager in 1977. However, City went through a spell where they had one win in 26 matches and Frank’s tenure was not a happy one. Arsenal had arranged no end of season tour, but they had arranged a pre-season game, which they apparently could not get out of, and so did not play in the Charity Shield the following August. Since then of course Arsenal have of course repeated the achievement twice more. Elsewhere in football, Tottenham gained tiny amount of consolation for their end of season humiliation by winning the league cup, Leeds as we have noted won the Fairs Cup and Chelsea won the Cup Winners Cup. There was also an oddity this season: the Ford Sporting League. For this trophy clubs were awarded a point for every goal scored at home and two points for every goal scored away, but lost 5 points if a player was booked and 10 points if a player was sent off. Points were earned and lost across the league season with all league clubs being part of the event. However as the 3rd and 4th divisions played more matches only the first 42 league matches for those leagues counted. Oldham won the league and picked up £70,000 – the equivalent of around £1m in 2015 finances. In 2015 the Daily Mirror ran an article on the Ford League and endeavoured to work out who would have won it in the 2014/15 season. And the problem they found was that not a single club would have ended up with a positive score, the winner being Bristol City with -109 points. That is minus 109. The problem of course is that while the number of goals hasn’t changed that much, the number of sendings off and bookings has escalated. In the 1970s they were very rare indeed – now of course we expect three or four yellow cards a game. However this sponsorship was part of the very first moves into such financing of football by outside agencies, for also on the scene for 1970/1 was the Watney Cup (a knockout competition between the top scoring teams of the previous season who had not won promotion or got into Europe) and the Texaco Cup (in which 16 teams from England and Scotland which had not qualified for Europe took part). It is a reflection on the times that teams from N Ireland and Ireland were invited, accepted and then withdrew because of political pressures. As a result this later became the Anglo-Scottish Cup. Then, in a move that wasn’t noticed at the time on 11 June 1971 Liam Brady joined Arsenal as apprentice professional from St Kevin’s Boys, aged 15. He turned pro two years later. On 29 June Don Howe left Arsenal having helped guide the club to the Double as first team coach. He moved on to WBA where he stayed until 1975 before a year at Galatasaray SK after which he returned to Arsenal as manager. Just 16 players played for Arsenal in the league this season with one of those (Marinello) getting one start and one other, Sammy Nelson, getting two. The goalscoring had returned big time with Kennedy getting 19, Radford 15 and Graham 11. George Armstrong was back on the scene as well, playing every single league match and scoring seven. The other members of the “42” club were Bob Wilson and Frank McLintock. Rice, Radford and Kennedy each played in 41 games. Terry Burton, who was the captain, didn’t play for Arsenal first team, and after not getting a professional contract in 1971 he joined Folkestone. But he did return to Arsenal in 2012 as head development coach. Paul Davis, Brian Hornsby, Brendon Batson, and David Price you will know. Denis Hill-Wood (Chairman), Guy Smith, Robert Bellinger, Stuart McIntyre, Noel Bone, Bob Wall (Secretary). This article comes from the series Arsenal in the 70s which is published in full on this site.